Is Pacquiao sticking it to Bradley? By John F. McKenna (McJack): By choosing World Boxing Organization (WBO) lightweight champion Juan Manuel Marquez (54-6-1, 39 KO’s) to be his next opponent many boxing pundits are of the opinion that Filipino icon Manny Pacquaio (54-4-2, 38 KO’s) is “sticking it” to new WBO welterweight champion Timothy Bradley (29-0-1, 12 KO’s). Apparently frustrated that Pacquiao chose not to exercise the rematch clause in his contract Bradley has made numerous comments to the press apparently in an effort to goad “Pacman” into another fight. Many of Bradley’s comments border on the absurd, including saying that Pacquiao is “scared” and “chicken” to fight him again. Another of Timothy’s remarks is that with two good legs he would give Pacquiao “hell” in another match. This apparently referencing the injury he suffered in the Pacquiao fight. The reality is however that despite what Bradley says Pacquiao clearly dominated him last June. Many boxing pundits and fans do not see the need for a 2nd Pacquiao – Bradley fight. More significantly for Bradley however though are the poor Pay Per View (PPV) sales the fight brought in. Despite the fact that the fight was heavily promoted by HBO the Pacquiao – Bradley fight brought in a meager 700,000 to 800,000 in PPV sales. In essence the low PPV sales spelled the death knell for Bradley getting Pacquiao into the ring with him again. Bradley’s frustration is likely only to grow in the coming months. His mindset was that if he beat Pacquiao, other top name fighters would be lining up to fight him. Unfortunately for “Desert Storm” that has not happened. Bradley for whatever reason has had a long history of not being able to draw fans to his fights. The harsh reality is that even with Manny Pacquiao’s name on the fight ticket the PPV sales for Pacquaio – Bradely were dismal. And a rematch would likely not bring in the kind of numbers needed to guarantee Pacquiao a $25 million purse. The main reason Pacquiao chose to fight Marquez a 4th time and not Bradley is that Marquez always brings in the fans and guarantees high PPV numbers. The bottom line as in any business was the determining factor in Pacquiao choosing “Dinamita” as his next opponent. The interpretation by some is that Pacquiao chose to “stick it” to Bradley by fighting Marquez, thereby depriving “Desert Storm” of another big pay day does not hold water. Manny chose Marquez because it made good business sense. 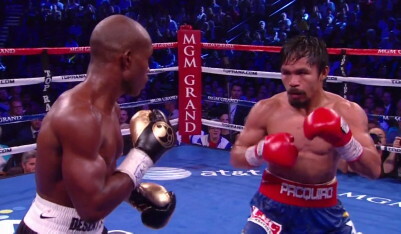 Boxing » Manny Pacquiao » Is Pacquiao sticking it to Bradley?